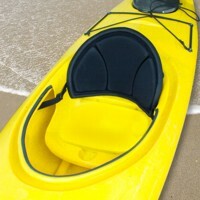 Add, or replace, back support to sit-in-side kayaks. The highly adaptable Tall Back Backband is the comfortable, ergonomic seating solution that sit-inside recreational kayakers have been looking for. Backband is 23 in. wide and 14 in. tall. 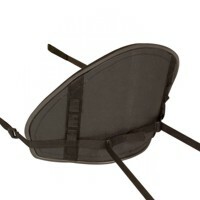 Made compression molded foam, laminated to a flexible panel to fit the curvature of the seat while providing a firm back support. The front of the backband has grooves that help the seatback curve naturally as it adjusts to the shape of your particular cockpit. On the back, a daisy-chain ladder system provides the framework for a variety of rigging options. The seatback extends out of the cockpit, providing both lower back support and upper back support. Can be used in many kayaks, best used for recreational kayaking. Fits a wide variety of different cockpit sizes and styles and attachment methods. 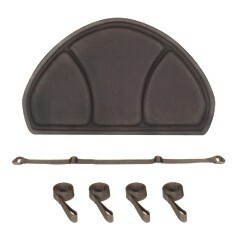 The Tall Back Backband is a kit for those who need to improve seating comfort or for uses as a replacement part. The rigging includes the main strap: a 28 inches length of 1 inch wide webbing with a tension lock at each end and two freely adjustable tri-glides in the middle; and four support straps: 36 inch lengths of 1 inch wide webbing with a 3 inch loop at one end. 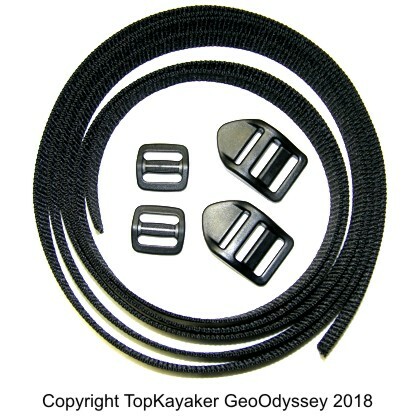 The main strap threads through two loops on the back of the band and serves as the focal point from which the four support straps diverge: two straps head forward, one from each tension lock, and two straps head backward, one from each tri-glide. If you're rigging to internal support posts, you simply strap it with these simple loops. If you're rigging to studs or bolts, you'll need to provide your own ¾ inch washers, fold over the strap end and melt a hole, with hot ice pick, through both layers. If you're rigging to pad-eyes you can use brass snaps. Footman’s loops and tri-glides can also be used. Stainless steel screws nuts and washers can come in handy. 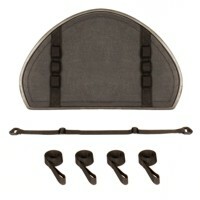 Rear facing straps might be best fastened to the rear edge of the seat bottom structure in some cases. Get creative and you can successfully affix this versatile seat to almost any sit-inside.